GOMA, Democratic Republic of the Congo, April 4 (UNHCR) – World attention will focus today on the scourge of landmines, but for tens of thousands of displaced people in eastern Democratic Republic of the Congo (DRC) the deadly weapons are a daily concern. The UN refugee agency will mark International Day for Mine Awareness and Assistance in Mine Action in DRC's volatile North Kivu province by taking part in various awareness programmes organized by the UN Mine Action Coordination Centre (UNMACC). The objective will be to highlight the danger of anti-personnel mines and unexploded ordnance, including bombs, grenades, bullets and artillery shells, and how they could affect the return and reintegration of the estimated 800,000 people displaced by years of fighting in North Kivu. Mines and UXO litter the landscape and are among the most pernicious effects of the years of conflict between rival armed forces. Moreover, because of the volatile security situation and the logistical challenges, no comprehensive landmine impact surveys have been conducted. The DRC government signed and ratified the anti-personnel mine-ban treaty in 2002, but this has made little real difference on the ground and at least 892 people have been killed and 1,118 injured around the country by landmines and UXO since 2001, according to UNMACC figures. The mines and UXO are a continual danger to the displaced and to those who return home to areas where there are unmapped minefields and stocks of UXO. Children are particularly vulnerable because some of these deadly weapons look like toys to them, while farmers are also at great risk while ploughing their land. The UN refugee agency's participation in today's programmes will complement the UNHCR-funded work conducted at sites for internally displaced people (IDP) in the Goma area by Synergie pour la Lutte Anti Mines (SYLAM), a non-governmental organization that specializes in mine awareness campaigns in North Kivu. SYLAM has developed an awareness campaign employing a prevention-is-better-than-cure approach. The aim is to teach IDPs and refugees how to spot a half-buried or fully exposed explosive device and to stress that they should leave the weapon alone, but report its presence to the authorities. "This way – and when returns start – persons are not at risk of playing with strange objects that could end up maiming or even killing them," said Masako Yonekawa, head of UNHCR's field office in Goma. 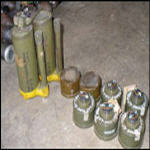 "Unexploded devices are (often) innocent looking, but they are deadly killers," said Marrion Kambale, SYLAM's project manager, while adding that her agency had recorded 111 deaths and 127 injuries caused by landmines or UXO in the province since it started its awareness activities in the camps in 2003. And though landmines and UXO have not been found inside IDP sites, their lurking menace is often not far away. In February, sappers from the DRC armed forces removed and destroyed an old anti-tank mine that had been found 20 metres from the Bulengo site, located west of Goma and home to 10,000 IDPs. Meanwhile, UNMACC, SYLAM and other associated organizations have identified and marked 51 sites polluted with landmines and UXOs in North Kivu. This mapping work will help mine clearers in the future as well as the people returning to these regions. But experience in other countries such as Afghanistan, Cambodia and Mozambique shows that it will take decades to clear the land.